If you have ever had to travel with the little ones where luggage is involved then you know the challenges that this can create. Keeping them entertained at the airport or train station is no easy task. This may turn into a much more pleasant adventure if you have a Trunki Ride On Suitcase. 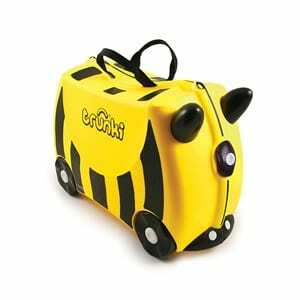 The Trunki Ride On Suitcase is a lightweight made of plastic yet durable suitcase designed just for the little traveler. Not only will it hold all their clothes but it fills in as a ride on toy that they can play with while waiting for the luggage to be loaded onto whatever mode of transportation is going to be used. The promoters of the Trunki Ride On Suitcase claim that this is a ride along and tow along suitcase for the kids that they absolutely love. They say that when not in use for travel purposes it can be used for at home play or for storing toys like a toy chest. The hype really focuses around the uniqueness of the Trunki Ride On Suitcase and it being something that is not only useful for many different purposes but something the kids can claim as being their very own. It appears that you can buy a Trunki Ride On Suitcase for around $50. Depending on where you are purchasing it from. The only commitment perhaps is being patient enough to let the kids pick out the Trunki Ride On Suitcase that they want. Currently the company is offering a very impressive selection of these items. In fact, you can even get a plain one that the kids can personalize on their own with their own creative art work. There is no doubt that this is an excellent idea. Yet ironically when introduced on the Dragon’s Den it was not all that well received. Nevertheless the inventors of this product did not allow this rejection to deter them, and they went on to be extremely successful. We are definitely going to give the Trunki Ride On Suitcase a thumbs up rating. A suitcase in general is something that every family who travels needs for their little one. This is a great way to keep the kids entertained when waiting to check the luggage. The little ones love to scoot around the airport on their Trunki Ride On Suitcase, and it means one less item that you have to carry. The fact that it is made specifically for the kids really adds to the importance of this product. It is getting favorable reviews from most of those who have purchased on. It holds up to 75 pounds. If you are looking for another unique item for when traveling with the kids you may want to take a look at the Blankid Buddy. This is a three in one items that can be converted into a backpack,a blanket or a stuffed animal. What do you think? Does the Trunki Ride On Suitcase work or not? Does the Phantom Saucer Really Work? Does CloudPets Teddy Really Work?